Union County, NJ – The Union County Board of Chosen Freeholders reminds residents, business owners and non-profit managers to submit nominations for the 27th annual Women of Excellence awards. The submission deadline is December 3rd. The awards celebrate women who have made a powerful impact on life in Union County. Women can be nominated for their achievements in the fields of Arts and Humanities, Business and Entrepreneurial, Community Service, Education, Government, Law, Law Enforcement, Medicine and Health Care and Child, Youth and Women’s Advocacy. Individuals, businesses, non-profits and government agencies can submit nominations for an award. Nominations are open to all women 21 years or older who live, volunteer or work in Union County. The awardees will be honored at the annual Women of Excellence gala awards dinner, to be held on March 29, 2019 at the Gran Centurions in Clark. Each awardee will receive an engraved Women of Excellence plaque and a Freeholder Resolution in their honor recognizing their impact on the Union County community. The Women of Excellence awards are sponsored by the Freeholder Board and the Union County Commission on the Status of Women, with the Union County Office on Women. For the first time this year, Women of Excellence nominations may be submitted online. To submit a Women of Excellence nomination online, visit ucnj.org/women-awards. Nominations will also continue to be accepted by mail. Mail-in nominations should be sent to the Union County Administration Building, Attn: DHS-Office of Outreach and Advocacy, 2nd Floor, 10 Elizabethtown Plaza, Elizabeth, NJ 07207. 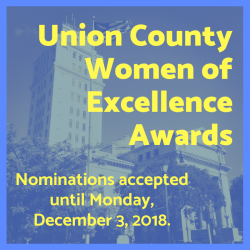 For any questions about the nomination process or to get more information about the Women of Excellence awards program, contact Elizabeth Sebring, Union County Department of Human Services, at 908-527-4890 or esebring@ucbj.org.